ChildAge: 3-11 years. Under 3 are free. Whether you're traveling as a group or as an individual, you can trust that the Disneyland Resort Express will get you to your hotel in a timely manner! 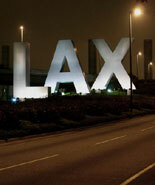 Transportation from Los Angeles International Airport to Anaheim area Hotels. This eTicket is good for a ONE WAY Transfer voucher FROM Los Angeles International Airport (LAX) TO Anaheim Hotels. Disneyland Resort Express would like to welcome you and your family to beautiful Anaheim. They offer the very best in luxury motorcoach transportation for your family, group, corporate event or social gathering. Choose Disneyland Resort Express and know that you will travel without worry and will be guided by their experienced and professional staff, every time. The Disneyland Resort Express makes it easy to travel from Los Angeles International Airport (LAX) to Anaheim Hotels. Convenient and reliable, the full size coaches offer luxury and comfort at a great price! The Disneyland Resort Express operates continuously throughout the day, 7 days a week. Traveling can be stressful. Take some stress off and try this safe, easy, relaxing trip to your Anaheim area hotel. Buy an eTicket today and experience the Disneyland Resort Express-LAX Airport to Hotel- Transportation. You deserve to sit back, relax, take in the sights and let the driver do the rest! Departs from LAX daily on an hourly basis from 7:50am to 3:45pm. Departs 5:00pm, 6:00pm, 7:00pm and 8:00pm. Please allow approximately 5 minutes between each terminal. Los Angeles International Airport Terminal 1. There is not a booth. Disneyland Resort Express picks up outside of baggage claim area, center island, under the overhead GREEN bus stop sign. Children ages: 3-11 years. Under 3 are free. This eTicket is for One Way transportation from LAX to Anaheim area hotels. Reservations are not required from the airport to your hotel. Service begins daily at 7:50 am with the last departure from LAX at 8:00 pm. Car-seats are not necessary as the coaches do not have restraints. If car-seats or strollers are brought, they can be stored in the luggage bays below. All infants and Toddlers must be seated on their parent or guardian's lap.